Every traveler has an endless number of questions to ask when planning their trip. Will I have internet coverage in the hotel? Is it too cold there? Does the hotel serve vegetarian food? Will the bus have recliner seats? What kind of hotels are included in this travel package? Tourism attracts people from diverse cultures and lifestyles. On travel websites, most travelers are seeking personalized answers to their specific questions. But tour sites or tour package listings only cover standard parameters such as dates and cost, nothing beyond. Travelers commonly face a homogeneous information overload on the internet. By adding chat to your website, your business gains a competitive edge as you provide direct customer support and specific answers in real time. Your competitors may say it is unfair, but we say, let them! Say hello to live chat and boost lead generation on your website! That’s why live chat is an important communication channel for tours and travel providers. Live Chat software is an instant messenger service that lets you lets you talk to and engage your customers on your website, in real time. You can provide immediate customer support, information and achieve live chat’s ultimate goal, i.e. better customer service. There are many common advantages of online chat for business websites. Travel industry in particular can get following benefits from a livechat tool. Travellers generally begin researching online before they decide where of how they want to travel. And especially leisure travelers go into planning undecided on a brand for car rental, air travel, lodging, cruises, vacation packages. Live chat for travel industry opens a direct communication channel with such potential customers in real time. Travel agents, hotels, trip planners and other services providers in this industry can use this opportunity to drive the customer’s curiosity to excitement with information that gives them reasons to book though your website. Live chat apps also allow you to manage multiple chat windows from the same dashboard. So unlike phone support where you can service one request at a time, live chat allows you to respond to multiple enthusiastic travelers. A high percentage of potential customers enter your hotel website through Online Travel Agencies (OTAs) like Make My Trip, Expedia, etc. If they make the final booking through OTAs, then of course your hotel pays the commission fees. But if they book directly with the hotel, then the profit margins will be higher. So, once the potential customer lands on your website, it is crucial that you provide real time customer service. By adding live chat on hotel website, you’ll be able to respond to your customers’ queries faster and help them make their final bookings! Try Fibotalk live chat for free. Last year when I was booking a ‘mountain-view’ room directly with a hotel, the owner tempted me with a ‘much better mountain view’ room. It was an upgrade which he suggested from Deluxe to Superior-Deluxe category. As a mountain lover, in my head, that was an upgrade from ‘good’ to ‘amazing’ experience. I grabbed the offer! The best time to request travelers to buy more is when they have their minds set on planning and booking. But the key to presenting offers is knowing their propensities and needs. With live chat on travel site, you can monitor your customer’s activity on your website and use this data to provide them with smarter offers like tour up-selling, etc. Example: The image shows the snapshot of Fibotalk live chat dashboard. 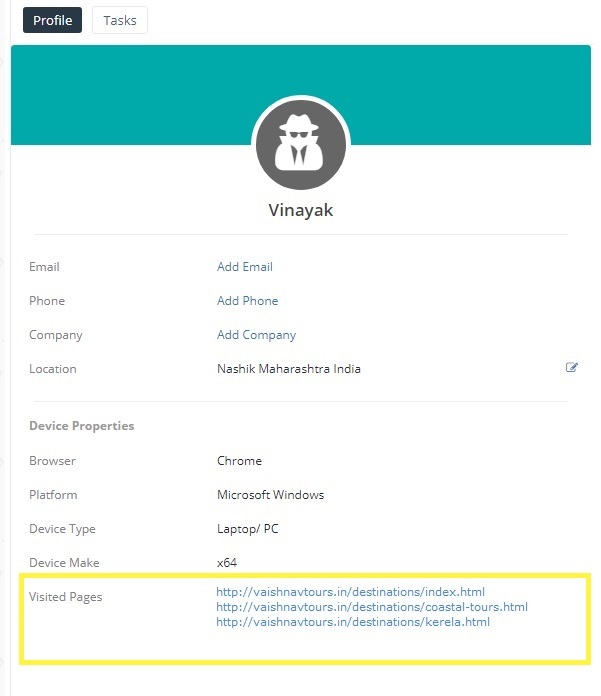 While chatting with a website visitor, the agent can see the travel packages viewed by him. With this, the agent can, for example, make an offer about Kerala Houseboat Tours and Backwater packages. In today’s age, most of us (including your website customers and target audience) are planning their vacations through social media channels such as Facebook. So whether it’s on your Facebook page or on your own website, you can set up a chat tool that speaks to your customers on their preferred channel, without any effort required from your customer’s side. Help Link: How to integrate Fibotalk live chat with Facebook page? Travellers browse through dozens of travel websites in search of inspiration and deals. Yours may be one of them. But simply browsing doesn’t answer all their queries, so customers remain unsatisfied and keep looking for more. As they scour more and more, they may end up forgetting all about your website and your offers. Prospective travelers may forget about your website, but you can remember them and nurture as leads. With the help of the contact management tool in Fibotalk’s live chat tool, you can have a consolidated record of all website visitors, links visited by them and their interaction with your agents. Your agents can download this data and use the information gathered about the prospective customer’s travel goals and follow up through other channels such as email campaigns and social media. Fibotalk’s task manager even helps your support agents keep track of following up with pre-set reminders sent via email. Travel involves taking a number of decisions throughout the entire experience. Customers are truly delighted by service providers that offer them better, easier and personalized solutions along the way. Travel companies can spare their potential customers the extra effort of crawling through the website, answer their queries in real time and acquire leads faster. Fibotalk is a website live chat tool that has been built to provide easy and quick customer service to visitors on website and social media channels managed by businesses. Sign-up to try forever free version.